When the sum of the measures of two angles is 90°, such angles are called complementary angles and each angle is called a complement of the other. The vertices of two angles may be same or different. In the given figure ∠AOB and ∠BOC are complementary as ∠AOB + ∠BOC = 30° + 60° = 90°. Again, ∠PQR and ∠QRP are complementary as ∠PQR + ∠QRP = 40° + 50° = 90°. 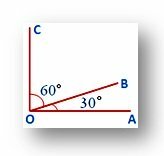 Angles of measure 25° and 65° are complementary angles. The angle of 25° is the complement of the angle of 65° and the angle of 65° is the complement of the angle of 25°. The complement of an angle of measure 32° is the angle of 58°. And, the complement of the angle of measure 58° is the angle of 32°. (i) If two are complement of each other, then each is an acute angle. But any two acute angles need not be complementary. 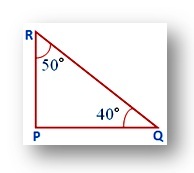 For example, angles of measure 30° and 50° are not complement of each other. (ii) Two obtuse angles cannot be complement of each other. (iii) Two right angles cannot be complement of each other. 2. Find the complement of the angle (10 + y)°. 3. Find the measure of an angle which is 46° less than its complement.